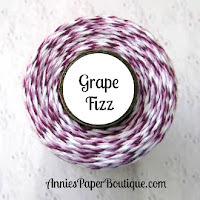 It's Millie, from Crafting with Creative M with a pretty project with this month's beautiful feature the "Grape Fizz Trendy Twine". 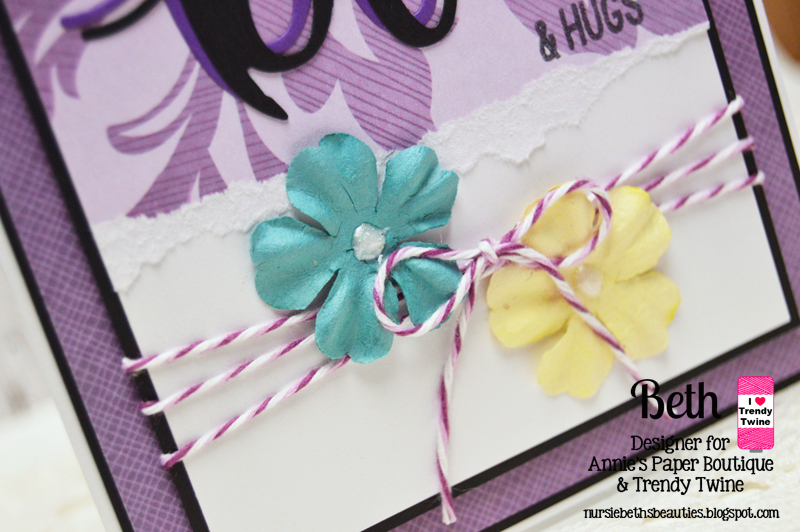 Here is what I created.....A Spring Shaker card!! I wrapped a piece of Grape Fizz twine around the top portion of my shaker card and adhered a "Spring" die cut to the center. I used a flower card base from the DS and I placed adhesive to the back cover of the flower portion. Next, I started to wrap my pretty flowers with the Grape Fizz twine. I added some pretty and colorful sequins. 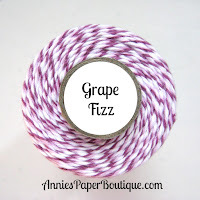 This is Shelly over at My Paper Love sharing a fun little Spring treat showcasing Grape Fizz Trendy Twine & the new Grape Fizz Sequins. I created a fun little treat box. I used a clear take out box from Annie's Boutique. These are so fantastic! I die cut daisies and added some gorgeous Lemon Shaker & Grape Fizz Sequins. The best color combo in my opinion. I topped off my little take out box with a MCT tag using more sequins and Grape Fizz Trendy Twine. Lastly, I stamped a Happy spring sentiment! There's only a few more days left of our showcase products and sale so stop on over. Hello everyone! I'm Helen from HTB Creations. 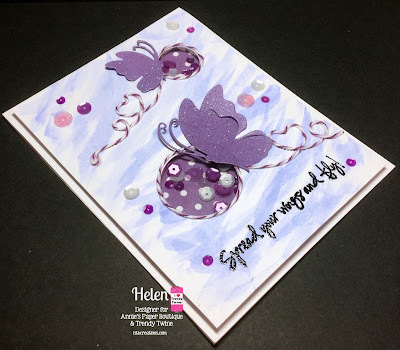 I'm here with a quick spring card to show you.I used Grape Fizz Trendy Twine and the new Grape Fizz Sequins. The flowers are from the Cricut Create a Critter Cardridge. I wrapped my Grape Fizz Twine around the card, stamped my sentiment on, and pop-dotted the flowers on. It needed something else so I grabbed my Grape Fizz Sequins and added some to the card. You can't tell very well from the picture, but I did add a clear Wink of Stella Pen to the dark purple flower to add some sparkle. I hope you stop by Annie's Paper Boutique to grape this fabulous twine while its on sale. While you are there, check out all the fun goodies you can get at some great prices! Good morning my crafty friends! Beth from Beth's Beauties here with you today. 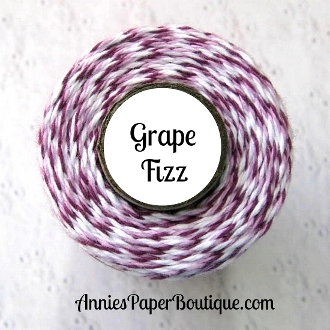 This month, we are spotlighting Grape Fizz Trendy Twine and here is the card I have to share with you. I wanted to keep this card pretty simple and let the sentiment make a bold statement. 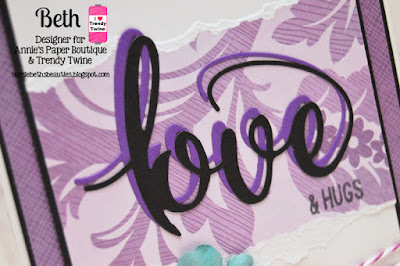 The love die and stamp are from Pink and Main. The papers are from DCWV's Bouquet De Fleur stack. The beautiful Grape Fizz Trendy Twine made the perfect embellishment, and for the last touch, I added two flowers for a little pop of color. Kimberly from Kimberly's Crafty Spot today to share a project. I used one of the flat Kraft Bags and decorated the outside. 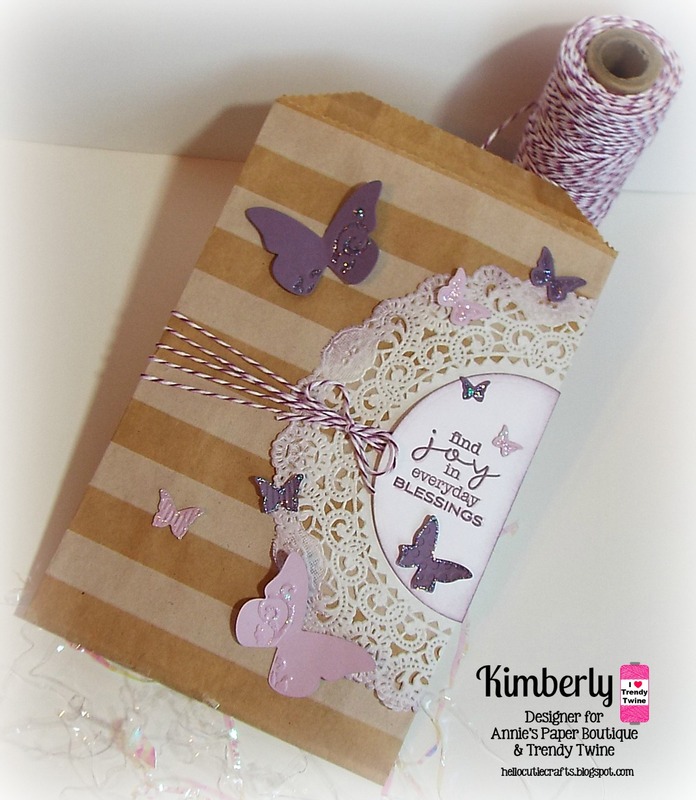 I used a some pretty butterfly die cuts to match the Grape Fizz Trendy Twine. I added a large doily to the side of the bag, wrapped some Grape fizz twine around it and tied a bow, next I added a die cut circle with a sentiment (My Favorite Things) in coordinating purple ink and some sponging in purple around the edge of the doily and circle. 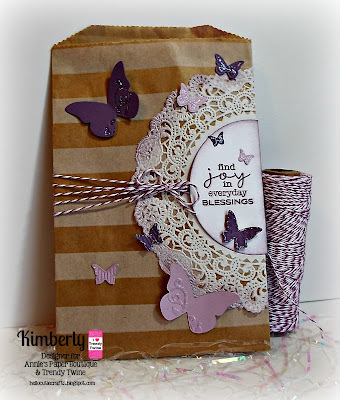 I finished off the bag with some die cut butterflies and a little bit of star dust stickles. Check the rest of the details out on my blog. 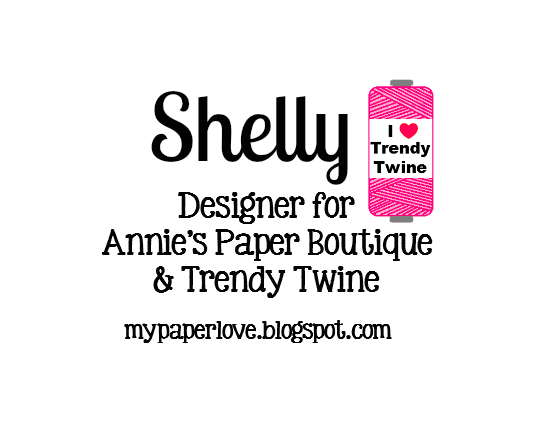 This is Shelly from My Paper Love with some fun birthday tags showcasing this months Grape Fizz Trendy Twine & the new Grape Fizz Sequins. I just love this combo, it's fabulous! I just love making tags for gifts! I used a great tag die cut set with this great color combo. I love how the mint and lavender look together. I used a great party hat and added an awesome Grape Fizz Trendy Twine pom pom. Lastly, I added some gorgeous Grape Fizz Sequins my new favorite color! 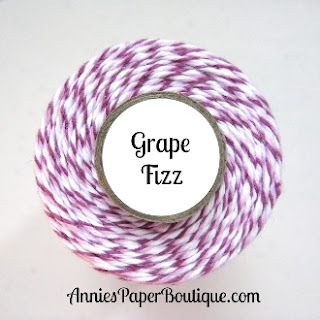 This month the team is featuring Spring and Grape Fizz Trendy Twine. I used the Abby's Spring Showers stamp set for this card. This girl is just too sweet. So I colored her and her umbrella with copic markers trying out some No Line coloring. I also added the Grape fizz Trendy Twine as a fun whimsical border to the card with a bow on top. I took some pastel purple paper and made a frame, added some clear acetate for the window and popped it up with foam adhesive for the sequins. Next I added the panel with the sentiment and raindrops. I adhered this to a light teal card base. For the rest of the details, please visit my blog. This is Shelly from My Paper Love with a fun card showcasing the fabulous Grape Fizz Sequins. Oh my gosh, are these sequins gorgeous! They are absolutely a must have! I wanted to keep my card simple and just let those gorgeous sequins shine! I mean, how could you not? Okay, take a look at these babies... Gorgeous I tell you, so gorgeous! 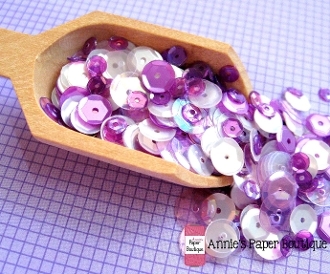 Stop by the Boutique and grab some Grape Fizz Sequins. Hi! Welcome to another Planner Friday! I'm Amanda from She's Eclectic and I am here again to share with you how I use Annie's Paper Boutique products to help keep me organised. 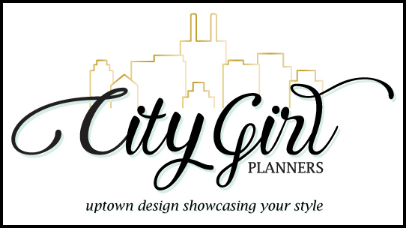 I have always loved using a planner, over the years I have tried lots of different types and styles before I finally settled into my planning rhythm and found my groove. I found that sometimes I got bored with regular diaries and organisers which meant I didn't use them every day but then I stumbled up on the planner community and saw people who decorated their pages and made them fun too. I started off with a couple of rolls of washi tape and some pretty stickers and I have been decorating my planner pages ever since! I really enjoy using stamps in my organiser, I like how they look and they make my to do lists and reminders easy to read. Using stamps also saves me time, I used to hate having to write the same reminders in my organiser each week but now I can just stamp them in quickly and it is done! As well as the practical stamps I use each week (At Home, School Days and Check It Off sets) I like to use some fun stamps too. I think the Weekend Banner is great for highlighting my weekend and I love bunting, it always looks so celebratory and makes me feel happy. Because I decorate my planner I find I check my pages more often than I did before and this helps me stay on top of things. I have my reminders and to do's split into daily, manageable lists and breaking everything down into steps makes them easier for me to complete. I also enjoy checking things off when they are done with a little flourish, it is very satisfying! I you want to check out the whole range of Planner Stamps from Annie's Paper Boutique you can find them all here. I am sure you will find the perfect set for you! I hope I will see you again next month for another Planner Friday! 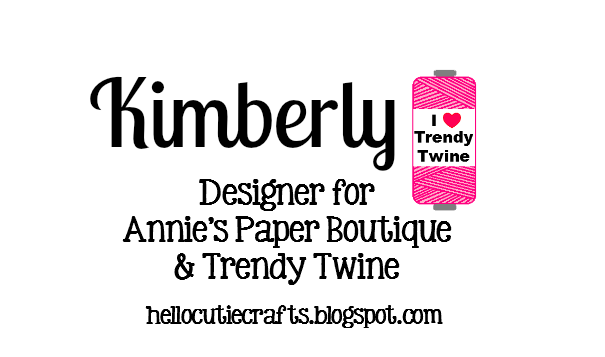 Trendy Twine - Welcome Spring! 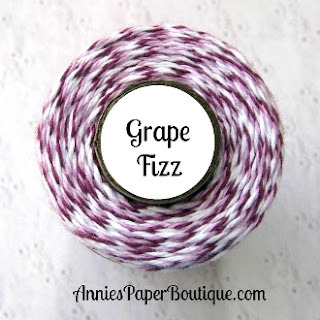 It's Millie, from Crafting with Creative M with a super fun project with this month's feature "Grape Fizz Trendy Twine". I started with a pretty & colorful 12x12 page that I found in between my paper stash. How lucky was I! It went perfect with my Spring theme. I also used Bazzill Basics dotted swiss card stock for some texture. The die cut banner is from the Straight from the Nest cartridge. The "welcome" title on the pretty banner is from the Songbird cartridge. I used the Grape Fizz Trendy Twine on my banner and bows. To each bow I added strips of the Grape Fizz twine and adhered die cut butterflies (DS) to the ends. Next, I added white pearls to the center of each bow. The "Spring!" title was popped up on foam dots for some dimension. I placed purple glitter enamel stickers on each dot for some sparkle. I wrapped the Grape Fizz twine around the corners of the ruffle square borders which is from the Celebrations cartridge and added tiny white pearls. I duplicated the grass die cut (DS) and adhered them using foam tape for dimension. I added pretty Grape Fizz bows to the tall birdcage from the Songbird cartridge and pearls. I wrapped the middle portion of my pretty butterflies with the Grape Fizz twine. I decided to try out making two shaker windows in the card. The plan was to used the purple polka dot paper on top, but that was too much purple with the butterflies. I pulled out white paper, but that was to plain. So I took a purple distress ink pad and used it as watercolor. I just swished it on the card stock making brush strokes. I used my Grape Fizz Trendy Twine to cover the circle openings and to cover the 'trail' that I stamped. Then I added some more Grape Fizz Sequins on the card too. The sentiment is embossed at the bottom.